It took nine days to get a reasonable selection of shots on the Ulm - Friedrichshafen line. Hopefully this picture shows why it was worth persevering despite the dreadful weather. 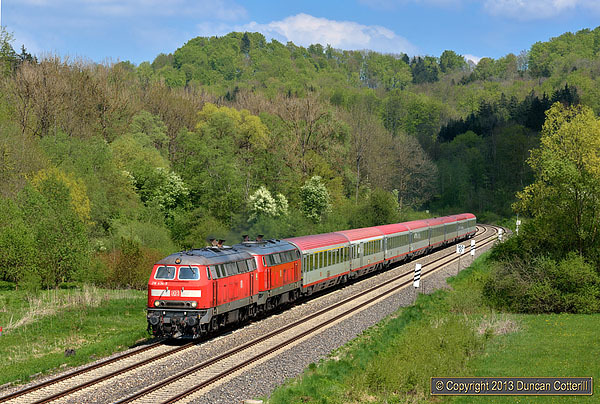 On 5 May 2013, 218.434 and 218.495 accelerated away from a sharp curve in the heart of the Schussentobel, the deep, wooded valley that carries the River Schussen and the railway through the uplands of the Altdorfer Wald, south of Aulendorf. The train is IC119, the 07:27 from Münster(Westf) Hbf to Innsbruck Hbf, formed of ÖBB stock and diesel hauled from Ulm to Lindau, with a reversal at Friedrichshafen. This was my first visit to this long north-south diesel worked line, also known as the Südbahn. The original plan was to spend a few days here before moving on to other diesel worked routes in the area but poor weather kept me in the area for over a week before I felt I’d got a reasonable selection of pics. The principal passenger services on the line are hourly IRE trains from Lindau to Ulm via Friedrichshafen, many of which continue to Stuttgart. These trains are worked by class 218 diesels at the Friedrichshafen end of push-pull sets. A few trains utilise single-deck coaches but most workings are formed of double-deck stock. 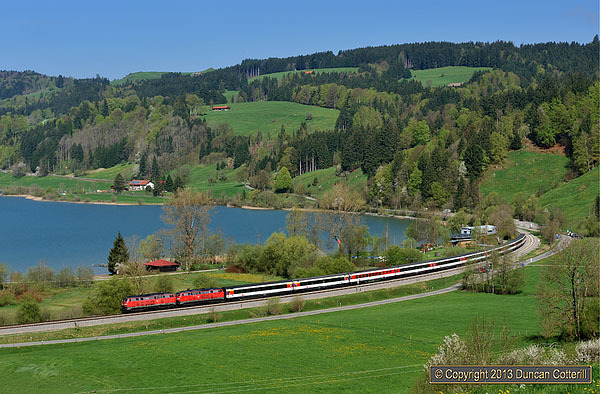 One IRE train in each direction is replaced by an IC service hauled by a pair of 218s on ÖBB stock, IC118 from Salzburg to Münster and IC119 from Münster to Innsbruck. An additional RE service runs from Ulm to Friedrichshafen on summer Sundays and some public holidays, aimed at cyclists and formed of a 218 on the south end of a push-pull set and at weekends and on holidays, several of the regular services are reformed to include a baggage car refitted to carry bikes. There are also DB class 611 DMUs on two-hourly Ulm – Basel IREs and more DMUs on local services. Between Aulendorf and Friedrichshafen the local service is worked by class 650 railcars operated by the Bodensee Oberschwaben Bahn, also known as BOB. I didn’t see enough locals north of Aulendorf to get a full picture but the few trains seen were worked by DB class 611s. 218.439 left Aulendorf with IRE4229, the 14:02 Stuttgart Hbf - Lindau Hbf, on the afternoon of 5 May 2013. Most trains are formed of double-deck push-pull stock and most change from electric to diesel traction at Ulm, although a minority are diesel worked all the way. There is only one regular freight train in daylight hours at the south end of the line, a 232 hauled stone train from Roßberg, on the Aulendorf – Kißlegg line, to Kressbronn, on the Friedrichshafen to Lindau line, that runs Mondays to Fridays. This train was seen three times north of Meckenbeuren, always within a couple of minutes of 11:05 (but never in good light). Only the Roßberg – Aulendorf – Friedrichshafen leg runs in the daytime. The train stables at Friedrichshafen all day then runs to Kressbronn, unloads and returns to Roßberg in the early hours, presumably so a single crew can operate the whole cycle from Friedrichshafen back to Friedrichshafen. I’d always ignored this line in the past, believing it to be flat and boring, which it is at the north end. South of Biberach is much more photogenic with some very attractive scenery and some excellent photographic locations, particularly around Wattenweiler, east of Bad Schussenried, Aulendorf and Meckenbeuren. The Schussentobel, a deep, twisting, wooded valley south of Aulendorf is extremely photogenic. I was attracted to the line by some photos I’d seen on www.drehscheibe-online.de and the dull weather experienced over the first few days gave me plenty of opportunity to explore, by rail first then by road and on foot, visiting the locations that had looked promising from the train. The rest of the time was spent at the good locations, hoping that the occasional sunny break would coincide with the passage of a train. After nine days I had a reasonable number of satisfactory pictures but hadn’t come close to exhausting the possibilities. This is another line that will require a return visit. Friday 3 May started off bright and sunny but it didn't last very long. This picture taken at 09:13 was the second and last shot of a loco hauled train in good light all day. Two shots in good light made this the second best of the nine days I spent on the line. 218.409 hauled IRE4241, the 06:59 from Stuttgart Hbf to Lindau Hbf, south towards Meckenbeuren just before the cloud arrived. There were extra bike trains on Sun 5 May when two 218s were employed on circular “Bodo Ringzug” workings from Friedrichshafen to Aulendorf, Kißlegg, Lindau and back to Friedrichshafen (or v.v.). The reversals at Kißlegg, Lindau and Friedrichshafen provided the rare opportunity to photograph locos at the north end of push-pull sets on the Südbahn The trains were running for "Bodo Erlebnistag" or Bodensee-Oberschwäben Experience Day, promoted by the local Verkehrsverbund. 218.431 traversed the Schussentobel with RE28626, the 12:20 Friedrichshafen to Friedrichshafen Ringzug on 5 May 2013. Another diesel worked line with loco hauled trains that I hadn’t really got round to investigating before. This line hosts three pairs of EuroCity services a day, running from München to Zürich and hauled as far as Lindau by pairs of class 218 diesels. 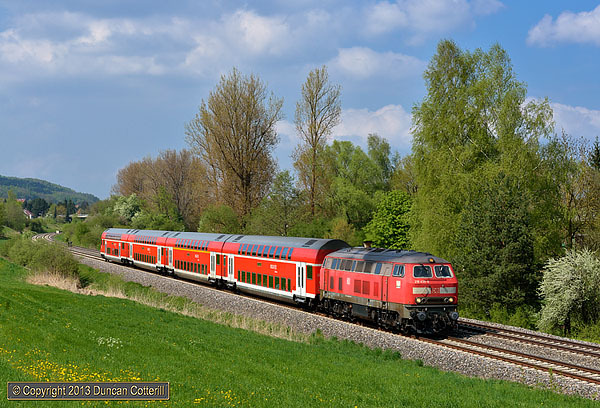 A few years ago many regional services were also worked by 218s on push-pull sets but the current service consists of Ulm – Memmingen – Kißlegg – Aulendorf and Aulendorf – Kißlegg – Lindau – Friedrichshafen locals worked by DB class 628 and class 650 DMUs. One loco worked regional service remains, running from München to Lindau in the evening and returning early the following morning. Freight traffic is sparse but HGK class 266 are known to appear on oil trains to Aichstetten or Memmingen running via Aulendorf or Kißlegg. A handful of attractive positions were found between Kißlegg and Leutkirch after travelling over the line by train but nothing was photographed in good light. For some reason it's taken over five years to get round to taking this shot of a train rounding the curve at the east end of the Alpsee, at Bühl, just west of Immenstadt. 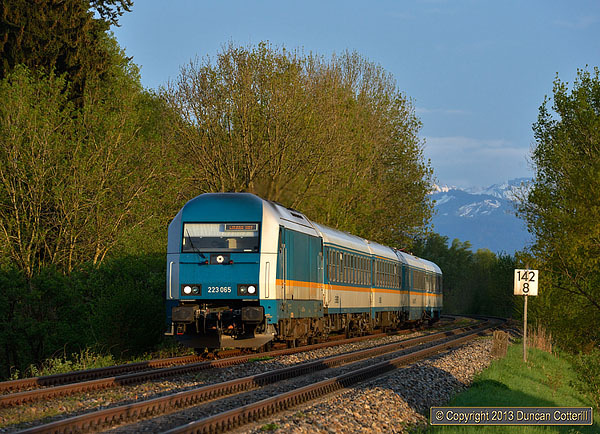 Two unidentified class 218s led IC191, the diverted 07:16 from Zürich HB to München Hbf, eastwards in perfect conditions on the morning of Sunday 5 May 2013. At ten coaches the train was unusually long on this occasion. The Allgäubahn is probably my favourite German line and should need no introduction as it’s been featured in these reports at least once a year since 2006. With EuroCity services diverted from the Memmingen route over the weekend of 4 - 5 May, it was inevitable that I’d spend some time here. There have been no significant changes over the last year with the usual mixture of 223s on ALEX trains and DB 612s on RE services at the west end of the line. The normal EuroCity service of one train each way a day was boosted to four each way by the diversion of the trains that normally run via the faster but less photogenic Memmingen route. Interestingly the trains were not retimed and just allowed to arrive at their destinations around 20 minutes late. This was despite there being a set of retimings in place for a further series of diversions from 18 May to 5 July. There is no regular freight traffic at the west end of the line. A few potential shots were checked out during dull weather on 30 April and I returned on the Saturday and Sunday to try to get the shots. A Saturday morning visit produced largely sunny weather but not when the trains were around. Sunday was much better with good light for morning and evening sessions on the line and several required pictures successfully bagged. 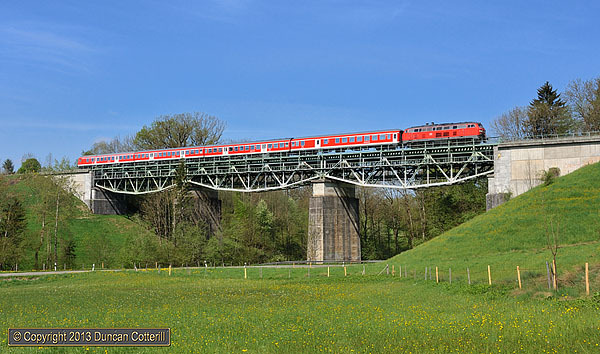 RE57392, the 08:03 München - Lindau bike train crossed Maria Thann bridge, east of Hergatz, behind an unidentified class 218, probably 218.454, on 5 May 2013. This train only runs on Saturdays, Sundays and public holidays over the summer period. 218s on red liveried Regio coaches used to be common on the Allgäubahn but this train is now the only working to bring this classic combination to the west end of the line. 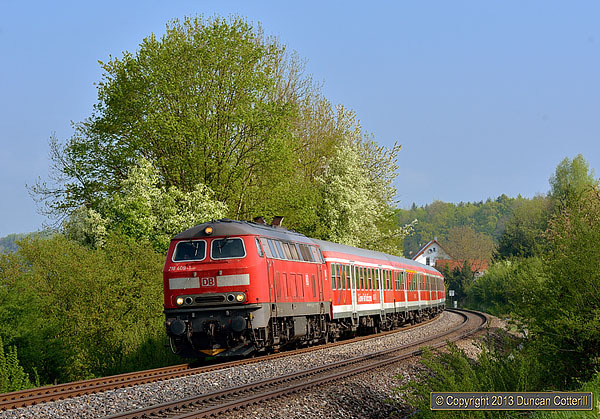 223.065 led ALX84152, the 17:19 München Hbf - Lindau Hbf ALEX service, past Höhenreute, about 5km short of its destination, at last light on 5 May 2013. The train is heading almost due north at this point and the mountains visible in the background are over the border in Austria. From Lindau I travelled to Switzerland for five days before returning to Germany.